OH NO! MR.Harbeck has amnesia! What ever will we do??? Its a good thing he left us these word and artifacts! Hi my name is Camille and I will be your teacher for today! Most of you already know what I'm going to be talking about but to some of you this is NEW information. So if okay so Lets start! Legs- shorter than the hypotenuse , comes out of the right angle, so each right triangle always has 2 legs. Hypotenuse- is the largest leg in a right angle, triangle and is always opposite to the right angle. R.A.T- the word R.A.T is a shorter way of saying right angle triangle. Greek- some one who has the ethnic background of Greece. or a native or inhabitant of Greece. Theorem- it is a idea that has been proven true. This is the artifacts one is a Greek man called Pythagoras, a square, a right angled triangle and a2+b2=c2. First we will be discussing the right angled triangle or also known as R.A.T. A square has four equal sides. All 90•. PYTHAGORAS! This is the Greek Dude we have been learning about! Pythagoras was a great mathematician. He is know for the therm, he made - the Pythagoras therm . ~ an interesting fact about Pythagoras was that some people did not believe he was a real person, that the Pythagoras therm was made by a group of people called the Pythagorean. Problem 1 This diagram shows the game plans for a game designed by Harbeck Toys INC. The board is made up of a square and four identical right triangles. 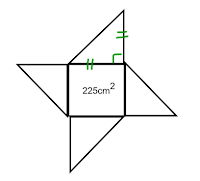 we know that 225 cm2 is the area of the square and that all the legs are even. So first we find out what the square root is for 225 cm is. So now we know all of the legs or sides equal to 15cm. Now we need to solve for the Hypotenuse: so we use the Pythagoras therm which we were talking about before. A) The square's diagonal is 4.2 cm. Here is part DEUX ! !